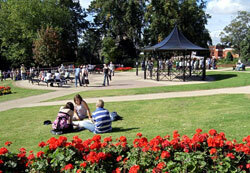 This park is in the centre of Hinckley town and is easily accessed off Church Walk and the car park. Access is also available from St Mary's church, Mount Road, St Mary's Road and Hill Street. In 2006, major improvements took place which included the installation of a bandstand that is available to host a wide variety of local and regional music performances. Access to the War Memorial and gardens was improved along with the pathways and enhanced lighting in the Mead. In addition, the enhanced hard landscaping has opened up the Mead to the town centre and created more seating areas for people to relax and listen to the entertainment. Events take place here throughout the summer. A new leisure centre was opened in spring 2016 to replace the former council buildings at Argents Mead. This was followed by the installation of a new town centre play area during the summer. In summer 2017 a new fountain was installed to improve the functionality and appearance of the moat and the park also won its first Green Flag Award. Argents Mead has won its second Green Flag Award this year (2018).